If I want to create a panel that floats on top of my game screen how do I that? At the moment my GUI is filling the whole screen. But its not clear how I should put components inside the window. I would like a scrollpane inside. Use Window's property called ContentGrid. Seems to be a bug with the scrollbar with scrollpane in the window. Thanks for reporting. I'll look into it. Added the UI Editor to the installation package. It's still far from being complete. Though some simple GUIs can be made with it already (see video in the end of this post). Some API changes. I.e. Grid.Children property had been renamed to Grid.Widgets. Various bug fixes. Including two mentioned in this thread (issue with placing cursor behind the last character in TextField & issue with ScrollPane inside the Window). The Nuget had been updated as well. Very nice, been playing with the UI editor. Are you planning on adding a spin button? Also I think if programmatically if images for back of buttons etc could be set this would be useful. Yeah, I'll add a spin button and a slider. And write detailed docs on how to make your own controls. Also Button has PressedBackground property(obviously it is rendered when button is pressed), OverBackground(when mouse is over it), DisabledBackground, etc. It containts 3 sample videos. The last one demonstrates adding of the menu bar. 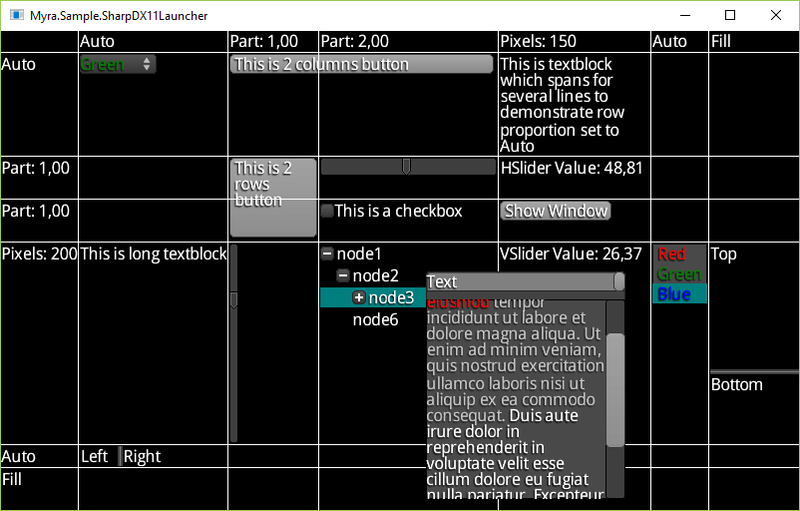 Also above link contains sample code demonstrating loading of the user interface made with UI Editor and locating widgets by id. I really would like to create my own stylesheet. I'm ok with the 3 files json, altas and altas image that have to be edited but then setting this to be used in code seems waaaay too hard. It should be ideally like one line of code myra.UseStyleSheet(json, atlas, atlasImage). If the style sheet editing could eventually find its way into the editor this would even be more great. Yeah, you're right. Probably providing their own UI stylesheet is number one thing every developer would want to do with Myra. So I'll prioritize making a sample demonstrating on how to archieve that. And the next step would be adding custom stylesheet support to the editor. Corresponding sample(CustomUIStylesheetSample) had been added to the distribution. It uses default UI stylesheet from the famous LibGDX framework. The new sample's screenshot is attached to this post. NuGet had been also updated. Thanks again for the feedbacks. I think i will give this a try in my game's prototype can't wait to try this. New version 0.4.0.0 is ready. Added SpinButton, HorizontalProgressBar and VerticalProgressBar widgets. Their usage is demonstrated at GridSample and CustomUIStylesheetSample. Also added ImageButton widget. Which is just a simplified version of the Button widget(which can have both image and text). As the UI part seems pretty complete functionality-wise I've started to add completely new feature to Myra: 3d engine. The end goal of that project is to make it simplistic, easy to use and sufficient for indie low-poly games. With MultiCompileEffect I've done first two shaders: DefaultEffect and TerrainEffect. Which are demonstrated on the new samples: Primitives3DSample(screenshot is attached) and TerrainSample. You can move there using WASD keys. Pressing right button and moving the mouse will make the camera rotate. 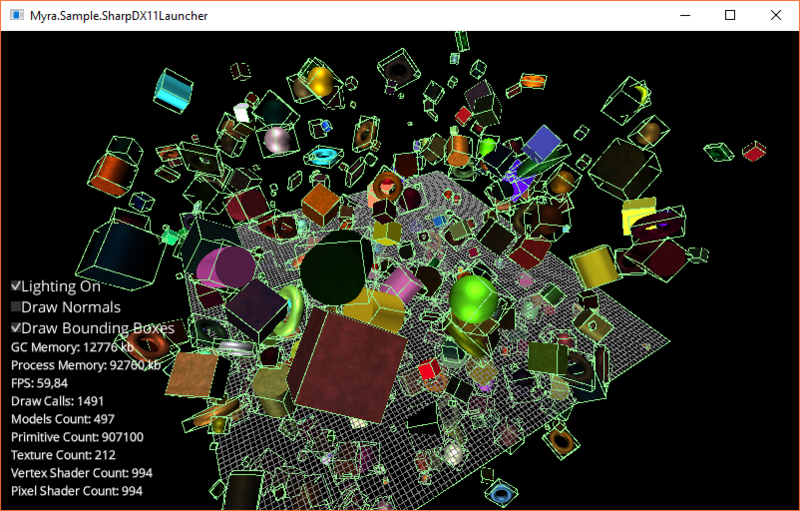 Would not it be better to place the 3D engine in its own library/dll ? If I use Myra for my UI, I don't need Myra's 3D engine alongside mine, even if I don't use it. ps: did you make your own OOBB ? From my memories, MG uses AABB. Probably you're right, I'll make separate Myra.Graphics3D library in future releases. I use MG's BoundingBox class for AABB calculations. Following discussion, I've removed 3d stuff from it for now. Probably it'll find it's place in the completely new project. Added FNA version of Myra. Myra.FNA.dll had been added to both NuGet and to MSI package. Also MSI package got FNA Samples Launcher. Some minor changes to the UI: Tree widget could be navigated with Up/Down keys. And Return key could be used to expand/collapse nodes. ScrollPane widget could be vertically scrolled using the mouse wheel. Both changes had been implemented to make the UI Editor more convinient to use. It can be turned off by setting CanFocus of either Tree or ScrollPane to false. Switched to MonoGame 3.6. Though it should work with 3.5 as well. Myra 0.4.5.76 had been released. Though it is far from being complete. The Loading Custom UI Stylesheet Guide had been updated appropriately. Btw, I would be glad to answer any questions and offer any assistance regarding Myra in the real time. Feel free to contact me at gitter. Only two days passed since the last announcement. And now there's new version. The major change is that Myra moved on top of MonoGame.Extended. FNA version of Myra had been dropped.